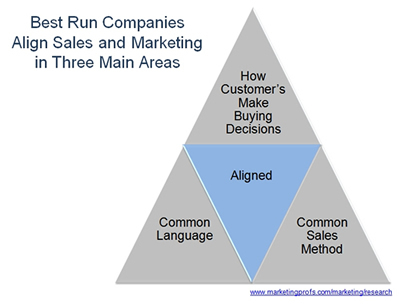 Companies are aligning sales and marketing in 3 main areas. A common language, the buying process, (how individuals make buying decisions to achieve their needs), and a common sales method. 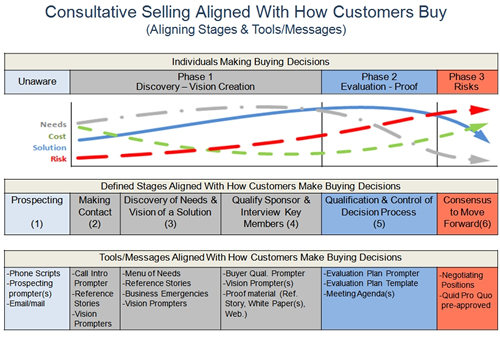 Before we jump into How to align sales marketing, lets answer the Why? In 2005 aligned sales and marketing companies were increasing sales 5% faster then their competitors. In 2010 Best in Class aligned companies were increasing sales 20% year over year. The 2010 study shows 50% more sales ready leads are being produced at 33% lower cost per lead. Aligning sales marketing can be low hanging fruit to increase sales. Our objective is to provide an overall frame work which allows the 3 areas of alignment to grow together in sales and marketing. The framework discussed below is built on the customers needs, the shifting concerns of Individuals making a buying decision, and using visual messaging. These types of messages allow customers to develop a Vision of a Solution, in their mind, based on value. The solution includes how your product-service capabilities help them achieve their needs. The Vision Group works in all 3 areas of aligning Sales Marketing. Our work is in the tactical side of Sales and Marketing. We are not a marketing design or advertising company. However, the "visual" messaging created for sales and marketing is used in all of our clients go-to-market sales channels as well as demand creation from a marketing standpoint. Our client's successes demonstrate the best place to start is around your customers needs and how they make decisions to buy your types of products-services. The method we use is to build a list of the feature-benefit statements, from a gouping of like products and services. Then drill into these looking for those which help the customer achieve their most compelling needs and are unique to your products or services. These feature rich statements are converted to customer focused messaging which allows the customer to visualize how to use the product-service capabilities to help them achieve their needs. Our clients tell us the best success in this exercise is a cross functional team. These teams are made up of sales, marketing and subject matter experts who understand how the product is used by the customers in their market or industry. We recommend using different teams as required based on the product or service groupings within a company. With these messages as building blocks, sales and marketing tools can be created to be used in prospecting, sales, and the demand generation activities needed to go-to-market. Examples include phone/email/mail prospecting, sales calls, sales letters, demo's, buyer evaluation meetings, press releases, success stories, ads, trade shows, pay per click, and web sites. As the customer focused messages are being used across the aligned sales marketing activities. A common language used internally and in front of customers begins to form a solid base. This is not to say you won't need different messages by different titles of prospects and customers you face. There may also be different variations required by markets or industries covered. Using messages built for the customers understanding and visualization of using the product, we begin to create the Best Buying Experience. The beginning of the "Best Customer Experience". To achieve the Best Buying Experience, B2B buyers expect sellers to understand their market. Prefering to work with sales people who can describe how their offerings can help solve their business needs and use behaviorally correct skills throughout a consultative buy-sell cycle. With a solid list of customer needs and messaging crafted to allow the customer to visualize usage, we are ready for the next step. Lining up a common sales method with the shifting concerns of how individuals make buying decisions. Whether the customer has one decision maker, or a Buying Committee, we are still selling to individuals with individual compelling needs. We use the following chart to drill in and determine which of the steps are necessary from the customer standpoint. Focusing on how customers buy your types of products and services. The agreed upon necessary stages and steps are then aligned with the customers buying process and needs. Once the sales stages and steps are defined, it is time to circle back to an age old question, what is a lead. 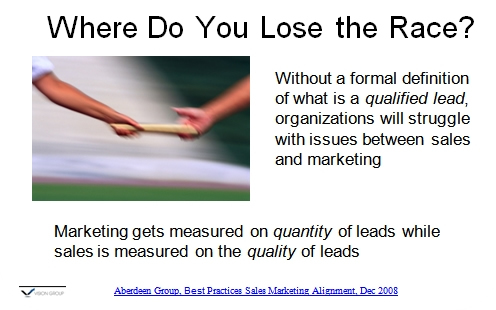 We focus on the place we tend to lose the race, the hand off of a marketing lead to a sales ready lead. 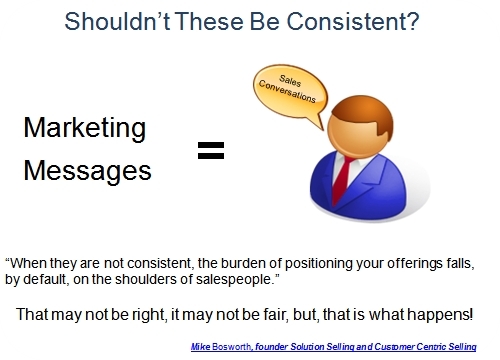 In the August 2010 study, an interesting point is the aligned sales marketing companies show 47% of the sales forecasted pipeline is generated by Marketing. To help align the sales marketing pipeline, a visual representation is where we begin. 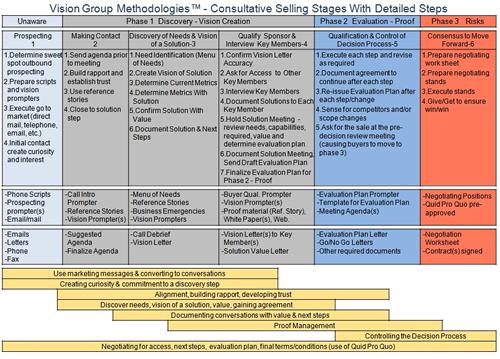 To be used properly, this chart would need to be modified to line up with the review of the sales stages and steps already completed. 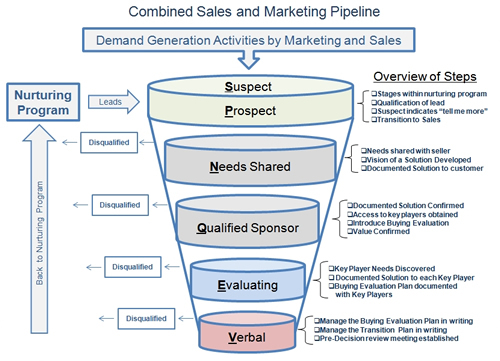 With this visual, we layout the buy-sell cycle and help facilitate agreement on the common language which describes a marketing lead and a sales ready lead. The following diagram depicts a high level view of how the best in class have created a common sales method focused on how customers make decisions to buy their types of products and services. Using messaging and support tools which resonanct with the customers and their compelling needs.